As usual, I’m drawn to the macabre so I kicked off my Leeds experience by taking in 3 papers on death, burial and the treatment of corpses. Basically, the premise here was: how were people buried? Why did people in the Middle Ages disturb corpses on a much more frequent basis than we do? And how were criminals treated during and after death? Anglos Saxon grave – skeletal remains of a 16-year-old female Catholic convert from Trumpington Meadows. The first paper was, False Continuity, Community Identity, and Death: The Creation of ‘Tradition’ in the Cemeteries of Northern Britain 650-900 AD by Alexandra Aversa Sheldon (University of Oxford). Sheldon’s areas of interest are: burial practices, churchyard cemeteries, and viewing death through an archaeological, theological, and anthropological lens. She started off by listing the various burial types and variations present in her studied period of 650-1066, not all of which are included here as her list was extensive: plank linings, clothed burials, chest burials, coffin burials etc… for the sake of brevity, in her talk Sheldon focused on the distribution patterns of log coffins (coffins made from whole hollowed out logs), quartz stone burials (where milky quartz was deposited on top of or inside the grave) and long cist (slab lined) burials. Sheldon explained that in the Early Medieval period, log coffin burials appear largely in the north before 800AD, but had previously had a history of use across England in the Bronze Age. Given its use at four of the sites she examined, and its presence in the Arthurian myth and hagiographical sources, she hypothesized that there appeared to be prestige and elevated social status associated with log coffin burials. Quartz burials were another practice with ancient heritage, seen on Neolithic graves, but resurging in use in late Iron Age Scotland. Large swaths of white stone covered the top of these graves, but the practice also included single white pebbles within the grave. Sheldon countered that they may represent a cross between local cultural practice and religion. St. Columba was reported to have blessed a white stone like the quartz stone and used it for healing, and curing stones continued to have a place in Anglo-Saxon medicinal purposes. She also added that the colour white in this period was associated with purity, goodness, God, and holiness, and it was often found in Anglo-Saxon religious poetic imagery. The second paper in the session tackled crumble burials in, From Outcast Sinners to Fellow Christians: The Effect of Purgatorial Thinking on the Burial Treatment of Executed Criminals in Medieval England 900-1200 AD, by Alyxandra Mattison (University of Sheffield). Mattison is a medieval archaeologist interested in corporeal punishment, decapitation, death and burial in Britain, and bodily fragmentation in the middle ages. Burials of Anglo-Norman criminal are not visible in the archaeological records. With Christianisation, burial in consecrated ground became important. In typical medieval burials, the corpse was often wrapped in a shroud, with the bodies oriented east-west, supine, with extended arms by their sides, and in simple, unfurnished graves. This is a problem for archaeologists looking for criminal burials; unless you can get radio carbon dating it is difficult to securely date churchyard graves. Deviant burials, however, give us some information. Deviant burials do not hey usually face east-west, they exemplify osteological trauma, like decapitation, or bone damage, and some show evidence of bound arms and legs. These deviant cemeteries became known as execution cemeteries. A list was compiled on Anglo-Saxon execution burials and they show a few similarities: they are located on the borders of hundreds or towns, but near roads in an effort to exclude sinners from the community of the dead, as criminals were excluded from the community of the living. There is also evidence that suggest criminals may have actually been executed at these places, because they are buried around what were believed to be gallows. There was an increase of these sites in the later period as government grew and exercised its control. After the Conquest, execution cemeteries were not abandoned immediately. When the Normans took over, they initially adopted the practices that the were used by the Anglo-Saxons as it took a while for Norman reeves and justices to replace Anglo-Saxon ones. However, no new cemeteries were created after the Conquest. 1.) Criminals were buried outside the known range of cemeteries. 2.) The bodies of criminals may have been left to hang until they rotted away and the remains scattered. 3.) William the Conqueror attempted to get rid of execution when he came into power. Execution still existed but he implemented mutilation as punishment for former death penalty offences. 4.) Criminals could have been buried in consecrated churchyards like everyone else – and Mattison believes this is the most likely case of the 4 reasons given for the lack of finding criminal burials in the Anglo-Norman period. Decapitation was one of the most identifiable methods of execution and easy to see with osteological evidence. Mattison found a sample from a church in Thetford and in Barton Bendish’s All Saint’s Church. The bodies were buried away from deviant cemeteries, buried facing east-west, and in consecrated ground. There were no arm or leg bindings found in Anglo-Norman periods, so even if criminals were hanged, they may have been buried in the churchyard. So why the sudden shift? This change may have been due to Norman cultural influences, like early conceptions of Purgatory which believed in providing a second chance to the soul. Anglo-Saxon corporeal punishment was limited to hand, tongue and foot mutilation. These mutilations replaced beheadings and the punishment was considered merciful because the soul was saved from death and the suffering of the criminal from physical wounds was believed to cleanse the sinner’s soul. William the Conqueror only has 1 execution occurring during his reign, he moved towards amputation, blinding and castration, as merciful substitutes for death. However, Mattison pointed out that it was difficult to find evidence of the move from execution to mutilation in osteological records because amputated hand and foot bones because these bones are delicate and often disintegrate or get lost. Our last paper talked about the medieval propensity for disturbing the dead. To the medieval mind – death wasn’t the end of the road, there was plenty that could be done after the deceased was put in the ground and this paper examined why they didn’t always stay there. What did medieval people do to their dead after they buried them? How were the dead treated? These are the questions Jennifer Crangle (University of Sheffield), tried to answer in, Post-Depositional Disturbance of the Medieval Buried Dead: A Functional Response to Overcrowded Cemeteries, or a Forgotten Funerary Practice. Crangle is a Funerary archeologist and focuses her research on the curation and the treatment of the dead in the Middle Ages. While the idea of disturbing a dead body seems pretty horrific to us, by looking at bones, we can see other reasons medieval people had for disturbing the dead. Rothwell Charnel Chapel. Photo courtesy of ITV. 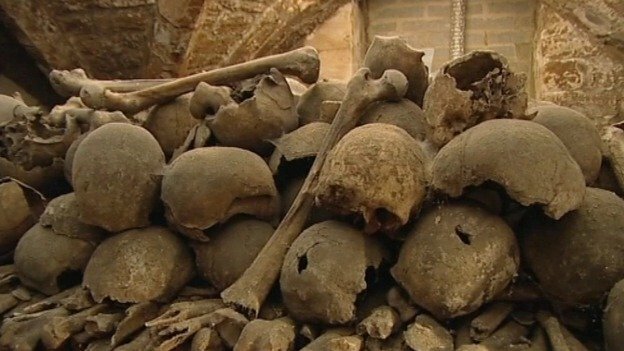 Crangle looked at charnel houses and medieval ossuaries, which were storehouses for the dead and for skeletal material. They were more commonly called Charnel Chapels, ossuaries, bone house, and had links to penance and confession. People assume that these were uncommon in medieval England however, they proliferated in the 12th century. Why was that? They spread because pilgrimage took off at this time along with a shift in the view of purgatory. This means they were clearly prevalent in medieval England. There were 2 types of charnel houses: they were either below churches, or freestanding and they always had a semi-subterranean basement chamber that was never completely underground. They were created this way for visibility and accessibility, and always in very prominent locations. These charnel houses were often along pilgrimage routes because they had links to relics. Another assumption was that graveyards were emptied for future interment and skeletal material was moved to charnel houses, like the situation that occurred in the late 18th century with Les Innocents in Paris. However this was not normally the case. Crangle looked at medieval cemetery management, and the types and range of sites. 25 of them gave very clear evidence that there was an ideal method for medieval burials. Rows were north-south, and bodies laid out east-west. The rows were filled from the north to the south and radiated from the outside of the church. When cemeteries became full, burials were placed between individual graves. This meant they knew where the bodies were buried and it wasn’t some haphazard operation. There was some evidence of intercutting but not directly to the bodies. Translations and elevations were found in cases of canonisation to recognise the individual as a saint. The ceremony was a community event with many people invited. The person who removed the bones out was usually the most pious person in the community, and often the head of a religious house or a monk. The bones were washed with water and relocated near the altar. In early graves, the individual religious community made this decision, but in the later medieval period, translation was a papal decision and the ceremony accompanying it was massive. Royal lay saints were also translated in the later Middle Ages, like the Winchester chests; it was not longer solely for ecclesiastics. Treatment of the dead didn’t finish once the body went into the ground, and there was also the idea of the ‘sentience’ of the corpse. In the Middle Ages, a corpse was considered dangerous. There was a prohibition against disturbing flesh burials; superstition, bad air, and blood contamination were all reasons to leave flesh burials alone. It was believed that it took a year for the body to fully decompose. Crangle finished by saying that the dead featured heavily in the lives of the living, and there was intense protection and care for the deceased’s physical remains and skeletal material. A website on the Rothwell Charnel Chapel project will be forthcoming in August 2015.